We offer Mumbai Domestic / International Air Port Pick Up and Drop Services. Pickup and Drop also available for/from Vapi, Surat, Navasari, Valsad, Pune. We will manage your shipment though its entire journey, from the collection from your premises to the selection of the most reliable direct route to the destination airport, customs clearance and final delivery to your customer on the date promised. Rest assured that our drivers will ensure you are transferred to and from the Airport in a timely manner to take the stress out of your journey. Shruti Tours & Travel have direct contacts with airlines, therefore, we can provide you with a very impressive service. At airports, we provide Meet and Greet services at every Arrival & Departure Gate. Our representatives are bearers of a special pass that enables them to receive travelers before they reach the Arrival Lounge. Airports apart, we also offer pick-up and drop facilities to and from Railway Stations, Cruises, Factory Plants, etc. modern classic infused with old world glamour that offers refined relaxation and sophisticated style combined with all the comforts of home. Accented with mahogany and dark walnut furnishings, unique upholstered pieces resonates compassion and care. This service is ideal for urgent deliveries to towns like Guwahati, Jammu, Calicut etc. where general courier takes 48 -72 hrs. The consignment is picked from your desk and booked to the destination airport. The consignment can be picked up by your consignee from the airport on the same day. We assure and provide a reliable pick up and drop service to all our guests. We provide vehicle options to our clients depending on their requirement and budget. For guests traveling in groups we provide coaches with a different seating arrangements ranging from a 12 to a 42 seater. We understand the importance of getting you to your destination on time. That is why time and time again people choose our company when they want a hassle free trip. There is a fixed price if the customer wants to be picked up from the airport and needs to be dropped off some place within the same city. For cities which have different domestic and international airport, the charges for the transfer from domestic airport might be different than those for international airport. 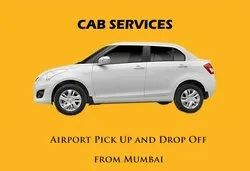 Rental AC Cab or Taxi service for Airport Pick-up & Drop-off in Mumbai Area.